This stained glass window, installed and dedicated in October 2014, was donated to St Paul's Church by the Middlesex Regimental Association and was designed by celebrated stained glass artist, John Reyntiens, who also designed the two Jubilee Windows in St Paul's Church. From the times when the Regiment was based in barracks in Mill Hill, there has been a long and close relationship between the Regiment and St Paul's, the story of which can be found in our History section. The Middlesex Regiment has since been amalgamated with other regiments but the Middlesex Regimental Association continues its ties with St Paul's and keeps the memories and traditions alive. 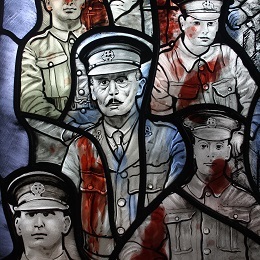 The Association commissioned the new window as a gift to the church, intended as a memorial to all who have served in the Regiment throughout its long and distinguished history. 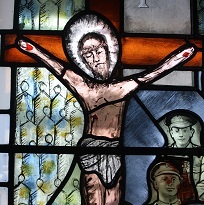 The body of the window is set on a tombstone and details in the window feature or symbolise troops, pain, suffering, death, an angel, the Ascension and celebration. The artist wanted to emphasise just how many people were involved in the Regiment by creating a mass of soldiers receding into the background. The servicemen in the forefront are depicted in quite a figurative way, and as we go further up the window, they recede, becoming more abstract. The use of a light red on the left hand side in various places is an indication that not everyone will make it through their professional life as soldiers unscathed. The sharp red areas towards the top of the window signify pain, fire and destruction. There are also tombs on the left that recede to bring to mind war cemeteries and the reality that people will suffer as indicated in the bottom of the window where we find our greatest emblem of suffering and redemption, Jesus Christ crucified. The poppies at the bottom are a familiar sign of remembrance. The left lancet is to do with life as we know it. At the base of the tomb there is a little blue and gold which then goes into the right hand lancet. The blue then spirals up towards the top of the tomb and becomes an angel who is there to take the servicemen from this world to the next. 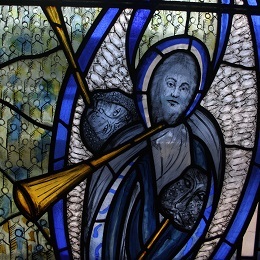 Apart from the poppies and the scroll, there is no red on the right hand side because this is not the world as we know it, rather this lancet with its emphasis on blue for purity and innocence going up the Heaven, signifies a movement towards the Glory of God celebrated by the three golden trumpets. There are shoots and leaves growing up on either side of the two lancets which are from the same leaf type as those found in the Middlesex Regimental Badge shown at the top of the window. These are to signify the continued growth in the community of those who support the Regiment.